3) A CTP history book of your choice with accompanying support materials. To enter, please leave a comment telling us what your giveaway preference is — #1, #2, #3 or Any. Entries will be taken until Saturday, August 31st and the three winners will be announced on Monday, September 2nd. When Christ and St. Ambrose triumphed over the fierce pride, the pagan sensualism and the sharpness of intellect of Augustine, the conversion of this intellectual titan produced some of the greatest books of both theology and literature. The Confessions is, next to the Bible, itself, the most permanent of all best sellers. And in the Civitas Dei, the City of God, St. Augustine created a classic which gave Christianity a working philosophy, buttressing the Faith. So far, philosophy had been predominately pagan. Augustine “baptized philosophy” just as St. Thomas Aquinas, eight hundred and fifty years later, may be said to have given it the sacrament of confirmation. Few men have equaled the amount of work he did from the time of his conversion to his death. One of his treatises is called “Eighty-three questions.” He was the first Christian philosopher to study the problem of Time which, according to him, God created together with the Universe, so that time was relative and not an absolute factor. And he gave much study to the phenomena of dreams and of the secret and hidden processes of the mind — fifteen hundred years before Einstein and the psychoanalysts. St. Monica — famous mother of a famous son. We might say her life mirrored the old saying that behind every great man is a great woman. Almost all we know about Monica is from the writings of her son — St. Augustine, bishop of Hippo and Doctor of the Church. She was married to a violent-tempered and dissolute pagan, but “in the long run, Monica’s prayers and example resulted in winning over to Christianity not only her husband, but also her cantankerous mother-in-law, whose presence as a permanent inmate of the house had added considerably to the younger woman’s difficulties.” It seems that St. Monica would be a sympathetic intercessor for those bearing with difficult in-law relationships as well as those suffering from alcoholism. In his Confessions, Augustine asks his readers to pray for the souls of his mother and father, but it is we who have implored Monica’s compassionate prayers as the patroness of Christian wives and mothers. 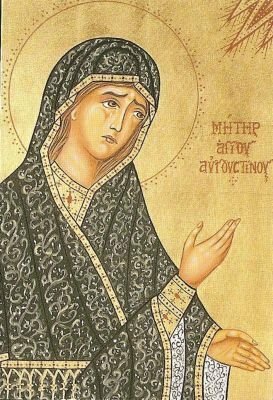 Exemplary Mother of the great Augustine, you perseveringly pursued your wayward son not with wild threats but with prayerful cries to heaven. Intercede for all mothers in our day so that they may learn to draw their children to God. Teach them how to remain close to their children, even the prodigal sons and daughters who have sadly gone astray. Dear St Monica, troubled wife and mother, many sorrows pierced your heart during your lifetime; yet you never despaired or lost faith. With confidence, persistence and profound faith, you prayed daily for the conversion of your beloved husband, Patricius and your beloved son, Augustine. Grant me that same fortitude, patience and trust in the Lord. Intercede for me, dear St. Monica, that God may favorably hear my plea for (mention your petition here) and grant me the grace to accept his will in all things, through Jesus Christ, our Lord, in the unity of the Holy Spirit, one God forever and ever. Amen. Coloring page for St. Monica. The Institute for Catholic Liberal Education now has free Mp3 downloads available from its 2013 Catholic Classical Education Conference. Some of the recorded sessions included are Creating Order in a Chaotic World by Dr Kevin Roberts, president of Wyoming Catholic College; Reflections on Recapturing the Tradition by a panel of headmasters, which included the Catholic Textbook Project’s publisher, Michael Van Hecke; Utilizing Primary Sources in History by Danny Flynn and Forming Virtue Through Literature and Great Books by Dr. Andrew Seeley and Headmaster Luke Macik. To listen to these and other speakers, go here. St. Rose of Lima, patroness of South America, was born a mere 54 years after the Spaniard, Francisco Pizarro, arrived in Peru bringing conquest and Christianity with him. Peru and almost half the South American continent was ruled by the Incas, a highly civilized peoples who worshiped the sun and revered their king as the child of the sun. Pizarro brought with him five Dominicans, and while the conquistadors relentlessly pursued gold, the missionaries zealously pursued souls. The Dominicans labored under many obstacles, but they “did splendid and efficient work in Christianizing the natives” (Catholic Encyclopedia) and founded many churches, monasteries, convents, and schools. St. Rose of Lima was educated by Dominicans and became a third order Dominican. From an early age, St. Rose devoted herself to a life of intense prayer and mortification, for which she was often misunderstood by family and neighbors and suffered from their ridicule. But she was also consoled by deep communion with Christ. She died at the young age of 31 on August 24, 1617 and was canonized in 1671 as the first saint of the New World. The mode of life and ascetical practices of St. Rose of Lima are suitable only for those few whom God calls to them; the ordinary Christian may not seek to copy them, but must look to the universal spirit of heroic sanctity behind them; for all the saints, whether in the world, in the desert or in the cloister, studied to live [sic] every moment to God. If we have a pure intention of always doing His will, as the governing principle of our whole lives, we thus consecrate to Him all our time, even our meals, our rest, our conversation and whatever else we do: all our works will thus be full. To learn more about Peru and its saints read these excerpts from a supplement (found on our website) to CTP’s Light the Nations I and All Ye Lands. St. Rose of Lima picture to color. Celebrate with St. Rose of Lima cookies. St. Rose of Lima: Patroness of the Americas by Sr. Mary Alphonsus, O.SS.R. Six miles from, and 1,000 feet above, my home, there is a monastery of cloistered nuns. In the Bethlehem Priory of St. Joseph reside 26 canonesses of the Order of Canons Regular of Prémontré, also know as the Premonstratensians, but more commonly and informally called “Norbertines,” since the order was founded by St. Norbert. This monastery had it’s beginnings under St. Michael’s Abbey, a community of Norbertine men in California that began with a group of seven priests from the Abbey of St. Michael in Csorna, Hungary. These men had fled from Hungary to escape Communist oppression and the suppression of their religious community. Eventually, Duke Geza, chief of the Magyars and the sole ruler of Hungary, saw the political necessity of Christianity. Hungary was a pagan country surrounded by Catholic countries. Continuing to shut out Christianity was a threat to Hungary’s security, and so Geza formed an alliance with the Christian nation of Poland by marrying Adelaide, sister of the Duke of Poland. Under Adelaide’s influence, Geza converted and was baptized by St. Adalbert of Prague. Many followed their chieftain’s example, but as usual some of the conversions were nominal with many converts still privately worshiping their old gods and practicing pagan customs. However, despite the insincerity of many, the Faith did spread among the Magyar people. One person whose conversion was sincere was Geza’s son, Vaik — baptised Istvan (Stephen). He was ten at the time, and his mother took great care that he not adopt pagan habits but fully assimilate the Christian faith. In 995, when he was 20, he married Gisela, sister of Henry, Duke of Bavaria (later known as Emperor St. Henry II), and two years later he succeeded Geza as ruler of Hungary. In his zeal to root out pagan superstition and idolatry, Stephen’s conversions were often made at the point of a sword. However, through his wife’s family ties, many priests and religious came from Germany to peacefully preach, instruct and water the seed of faith. On their heels and Stephen’s patronage, monasteries and schools were established throughout Hungary. Now the growing Church needed ecclesiastical organization in Stephen’s realm. In order to accomplish this with more authority, Stephen petitioned Pope Sylvester II to confer upon him the title of king. The Pope granted his request and sent him a royal crown with which he was crowned the first kind of Hungary in 1001. (“St. Stephen’s Crown” has been used to crown every King of Hungary since and is a national treasure of the Hungarian people.) The Pope also confirmed Stephen’s plans for regulating and organizing the Church in Hungary. …dearest son, even now in our kingdom the Church is proclaimed as young and newly planted, and for that reason she needs more prudent and trustworthy guardians lest a benefit which the divine mercy bestowed on us undeservedly should be destroyed and annihilated through your idleness, indolence or neglect. Beloved son, delight of my heart, hope of your posterity, I pray, I command, that at every time and in everything, strengthened by your devotion to me, you may show favor not only to relations and kin, or to the more eminent, be they leaders or rich men or neighbors or fellow countrymen, but also to foreigners and to all who come to you… Be merciful to all who are suffering violence, keeping always in your heart the example of the Lord who said: I desire mercy not sacrifice. Be patient with everyone, not only with the powerful, but also with the weak. Unfortunately, in the autumn of 1031 Emeric was killed while hunting boar. In grief, heirless, and suffering physical illness, Stephen’s last years were embittered with family disputes about who would succeed him to the throne. Some of these disputes ripened into cloak and dagger plots and assassination attempts. St. Stephen died at the age of 63 on the feast of the Assumption, August 15, 1038, and was buried beside his son at Stuhlweissenburg. His right hand remains incorrupt and is treasured at the Basilica of St. Stephen in Budapest as the most sacred relic of Hungary.